Home » downloader » AOL Downloader/Converter - How to Easily Download AOL Videos/Music? How to Download Videos/Music from AOL with AOL Downloader/Converter? AOL site provides us with news, sports, weather, entertainment, video, music and more. The information on the AOL site are very popular, especially the videos and music. As all the AOL videos and music cannot be watched or played offline, it is quite annoying that if there is no internet or we do not have enough time to watch them online. How to enjoy AOL videos or music offline? Is there a way to download AOL videos and music to convert AOL videos for any devices? The following article will tell a step by step guide on how to download videos or music from AOL to convert AOL videos or music for iPhone, iPad, iPod, PS3 with a professional AOL Downloader and Converter. 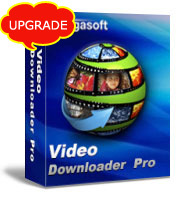 Bigasoft Video Downloader Pro is a brilliant AOL Downloader which enables to download AOL videos and music easily and fast. The good AOL Video Downloader is a nice AOL Converter that can convert AOL videos and music to any popular video and audio formats. With the professional AOL Video Converter, it is simple to convert AOL video or music to easily play AOL files in iPad/iPhone/iPod, PS3, Windows, Mac, Android, BlackBerry and Samsung and more. In addition, this AOL Downloader is a powerful video downloading tool that can download videos or music from more 1000 video and audio sharing sites with 1080P video quality and 3X fast downloading speed. The nice AOL Converter helps convert more than 158 video and audio formats with zero quality loss. How to Download AOL Videos and Music to Convert AOL Files with AOL Downloader and Converter? The following article will show a detailed guide on how to download videos or music from AOL sites with the brilliant AOL Video Downloader and AOL Video Converter to convert AOL files to play AOL video and music in iPad/iPhone/iPod, PS3, Windows, Mac, Android, BlackBerry and Samsung and more. 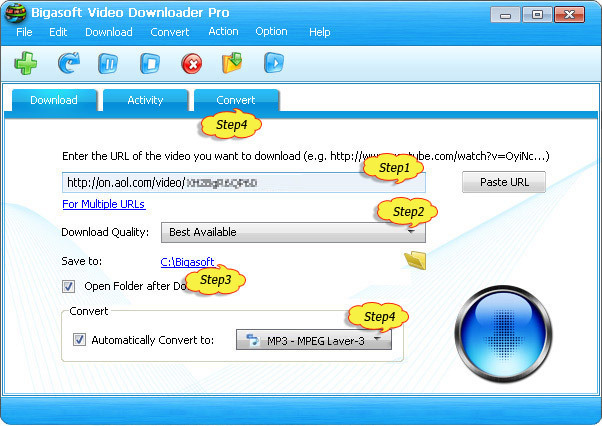 Launch the free trial version of AOL Downloader Converter - Bigasoft Video Downloader Pro (Windows Version, Mac Version), install and run it. Paste the URL of the AOL videos or music to the software. To batch download AOL videos or music, you need to click "For Multiple URLs". Go to the "Download Quality" button and set it as "Best Available" or "Normal" to adjust the quality. Click the "Save to" button to choose the path for the downloaded files. In order to freely play AOL videos or music in iPhone, iPad, iPod, PS3 and more offline, you can convert AOL files to more popular formats. You can go to the "Download" tab, click the "Automatically Convert to" to convert the files to the file format you want. You can also go to the "Convert" button and load the files to AOL Converter to convert AOL files. Bigasoft AOL Video Downloader and Converter also support cutting videos, increasing audio volumes and adjusting the video quality. AOL Downloader and Converter is the ideal choice to download AOL videos and music to convert AOL videos and music for iPhone, iPad, PSP, iPod and more. Free download AOL Video Downloader and AOL Video Converter to start downloading AOL files on Windows and Mac and to enjoy AOL files without limitation now.